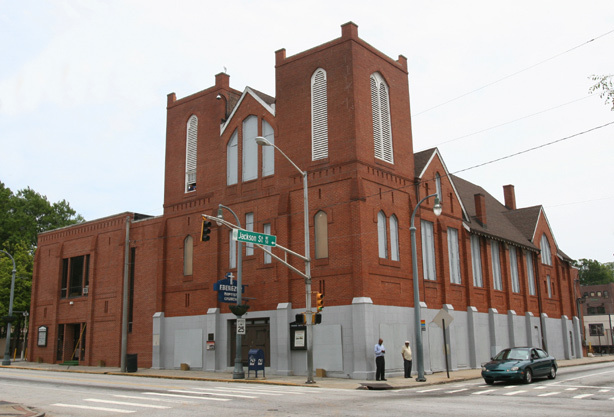 *After more than four years of refurbishing Ebenezer Baptist Church, the one thing that Peter Holness is most excited about is the work that was done beneath the balcony — which seems, well, not that impressive to the untrained eye. But standing beneath it, he recounts how workers not only replaced the support beams but also carefully numbered and re–installed every piece of tile and plaster that was removed to make the repair. Holness, the project manager for Keystone Restorations, which oversaw the project, sees a lot. But to someone making their first trip to the 89-year-old church – or someone who hasn’t been there since 1968 – the changes are hardly noticeable. Which is exactly what he was going for. Friday, for the first time since 2007, visitors to the Martin Luther King Jr. National Historic Site, had a chance to venture inside Ebenezer Baptist Church, which along with the National Cathedral in Washington and St. Patrick’s Cathedral in New York, is one of the most important churches in the country. It is the Late Gothic Revival-designed church, which opened in 1922, where King was baptized at the age of 5. It is also where he delivered his first sermon at the age of 17 and where he delivered his last one, “Drum Major Instinct,” on Feb. 4, 1968, exactly two months before he was killed. It has been closed since 2007, when the National Park Service – which controls the facility – decided to invest around $8 million in federal and private funds to restore it back to how it looked in the 1960s, when King was co-pastor along with his father. Previous ArticlePlanned Parenthood to Lose Funding?